In this tutorial we will learn How to interface RTC DS1307 with AVR microcontroller. We are using Atmega8 for the demo. that detects power failures and automatically switches to the battery supply. X1 and X2 (pin 1,2): Connections for Standard 32.768kHz Quartz Crystal. The internal oscillator circuitry is designed for operation with a crystal having a specified load capacitance (CL) of 12.5pF. X1 is the input to the oscillator and can optionally be connected to an external 32.768kHz oscillator. The output of the internal oscillator, X2, is floated if an external oscillator is connected to X1. VBAT (pin 3): Backup Supply Input for Any Standard 3V Lithium Cell or Other Energy Source. Battery voltage must be held between the minimum and maximum limits for proper operation. Diodes in series between the battery and the VBAT pin may prevent proper operation. If a backup supply is not required, VBAT may be grounded. The nominal power-fail trip point (VPF) voltage at which access to the RTC and user RAM is denied is set by the internal circuitry as 1.25 x VBAT nominal. A lithium battery with 48mAhr or greater will back up the DS1307 for more than 10 years in the absence of power at +25°C. SDA (pin 5): Serial Data Input/Output. SDA is the data input/output for the I2C serial interface. The SDA pin is open drain and requires an external pullup resistor. 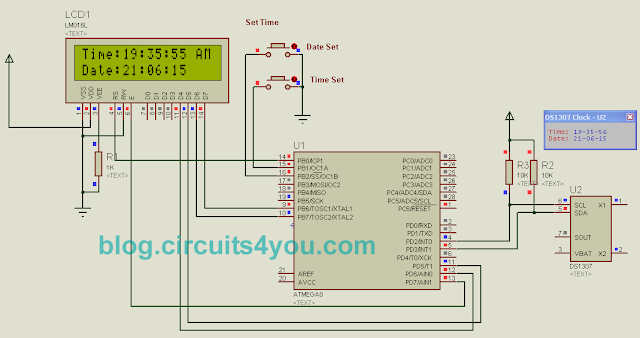 SCL (pin 6): Serial Clock Input. SCL is the clock input for the I2C interface and is used to synchronize data movement on the serial interface. SWQ/OUT (pin 7): Square Wave/Output Driver. When enabled, the SQWE bit set to 1, the SQW/OUT pin outputs one of four square-wave frequencies (1Hz, 4kHz, 8kHz, 32kHz). The SQW/OUT pin is open drain and requires an external pullup resistor. SQW/OUT operates with either VCC or VBAT applied. VCC (pin 8): Primary Power Supply. When voltage is applied within normal limits, the device is fully accessible and data can be written and read. When a backup supply is connected to the device and VCC is below VTP, read and writes are inhibited. However, the timekeeping function continues unaffected by the lower input voltage. and making SDA Line from High to Low. 2. Similarly I2C Stop Condition is generated by making SDA Line Low to High transition. 1. Slave Receiver Mode (Write Mode): Serial data and clock are received through SDA and SCL. After each byte is received an acknowledge bit is transmitted. START and STOP conditions are recognized as the beginning and end of a serial transfer. Hardware performs address recognition after reception of the slave address and direction bit (see Figure 5). The slave address byte is the first byte received after the master generates the START condition. The slave address byte contains the 7-bit DS1307 address, which is 1101000, followed by the direction bit (R/W), which for a write is 0. After receiving and decoding the slave address byte, the DS1307 outputs an acknowledge on SDA. After the DS1307 acknowledges the slave address + write bit, the master transmits a word address to the DS1307. This sets the register pointer on the DS1307, with the DS1307 acknowledging the transfer. The master can then transmit zero or more bytes of data with the DS1307 acknowledging each byte received. The register pointer automatically increments after each data byte are written. The master will generate a STOP condition to terminate the data write. 2. Slave Transmitter Mode (Read Mode): The first byte is received and handled as in the slave receiver mode. However, in this mode, the direction bit will indicate that the transfer direction is reversed. The DS1307 transmits serial data on SDA while the serial clock is input on SCL. START and STOP conditions are recognized as the beginning and end of a serial transfer. The slave address byte is the first byte received after the START condition is generated by the master. The slave address byte contains the 7-bit DS1307 address, which is 1101000, followed by the direction bit (R/W), which is 1 for a read. After receiving and decoding the slave address the DS1307 outputs an acknowledge on SDA. The DS1307 then begins to transmit data starting with the register address pointed to by the register pointer. If the register pointer is not written to before the initiation of a read mode the first address that is read is the last one stored in the register pointer. The register pointer automatically increments after each byte are read. The DS1307 must receive a Not Acknowledge to end a read. How if we want to use 7segment? Since a bit is getting missed in hour extraction. Hi I tried to construct the diagram above but it seems that i is not working i tried everything but still the LCD has no display. What should I do?